I figured a little update on some previous guests would be just the ticket - aren't you dying to know if anyone has had their home published? Been elevated to stardom? Switched careers? One blogger whose life and blog has simply blossomed is Shannon Acheson from AKA Design since my my original interview. Shannon and her husband, Dean sold their home and purchase another one last year. Slowly they are re-doing their current home using the same ingenuity and imagination that they used for their previous home, one that had been featured on many blogs and on the Steven and Chris show too! Not only does Shannon author the ever-so-successful AKA Design blog but she has recently started Blogger Homes and Blogger Resources, two fabulous blogs that are first and foremost for bloggers! 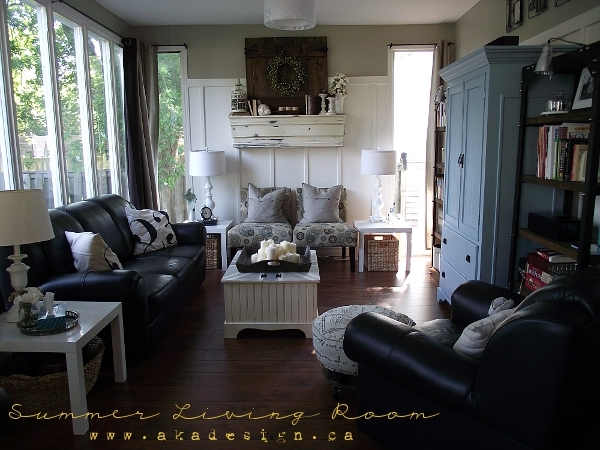 Even my living room has been featured on Blogger Homes! Shannon shared a few photos with us to see the direction their new home is taking. Clearly they are mixing their previous rustic aesthetic but with a new mix of modern too. Their new master bedroom, love the moody inky dark walls. Their former summer living room. 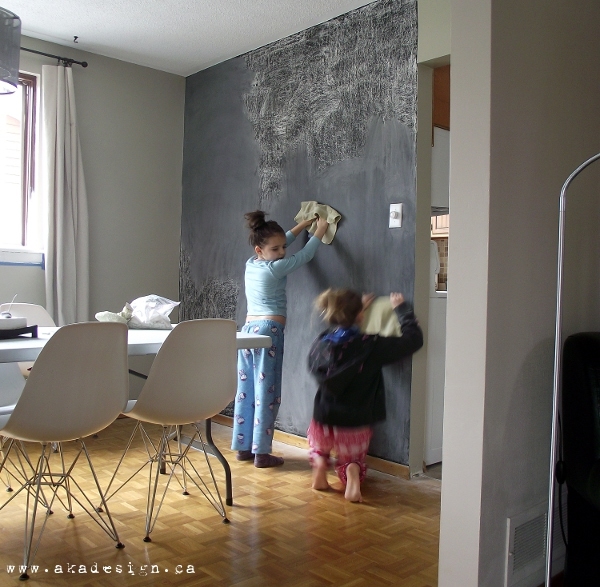 A chalkboard wall in their new house. I love it!!! If we end up staying in this house, I think I will paint a chalkboard wall in my kitchen too! Shannon, give us a quick update as to how life has changed since your feature here on hodge:podge well over a year ago? First of all thanks for having us back again! We’re so happy to be here. This past year has been very full for us. We worked with a couple of brands we love for the first time – The Home Depot and Bouclair. We had some magazine features and were interviewed on a podcast for the first time. Our family also sold our little 70 year old bungalow and moved into a slightly larger 40 year old backsplit and we’re LOVING the extra space and all the projects this newer house brings. We’re currently renovating the kitchen on a budget which includes painting cabinets and installing a stainless steel countertop designed by my hubby, Dean. Not only do you blog on (AKA) Design, but you have developed two other blogs, Blogger Homes and Blogger Resources. Tell us a bit about each website and why you decided to create both? Both of the new sites have been percolating in my brain for well over a year. I originally wanted to make Blogger Homes into a book, way back when I first scribbled down notes for the idea. 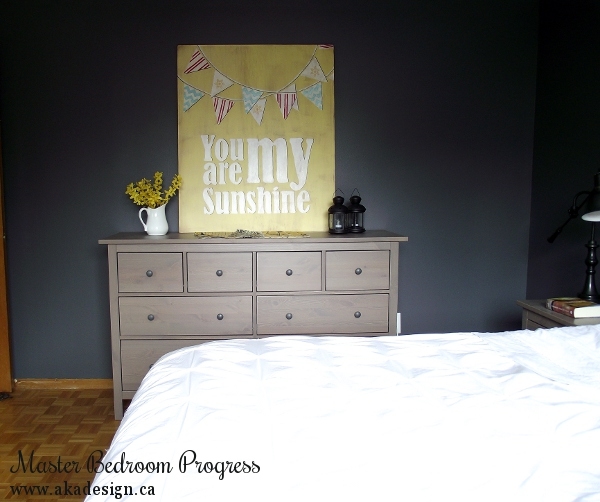 But then (I think it was in the fall) the amazing Jennifer of Rambling Renovators announced her book Blogger Style and I put my idea on hold. This January it hit me that I could still do something with my desire to see blogger’s homes all in one place. So I created Blogger Homes with the same sort of idea as Beckie Farrant’s KnockOff Décor. Submissions are categorized by blog, by room and by style and are easily searchable. Now Blogger Homes exists to make it easy for blog readers to search for and be inspired by all of the beautiful blogger-created rooms and spaces online. It also exists to drive traffic to home and lifestyle bloggers whose homes are featured on the site. Blogger Resources also started as some notes jotted down on a scrap of paper – go figure. I kept thinking that there are SO many fabulous resources out there for bloggers to learn and develop, but sometimes searching for them falls to the bottom of our never-ending to-do lists. Originally I was going to just add a page to AKA Design, but I wanted to think bigger and yet simpler. So Blogger Resources was born to help bloggers find all the brilliant people (much more brilliant than I!) and blogging resources they need to grow their blogs and reach their full blogging potential. Blogger Resources is categorized by type of resource (ebook, course, conference, etc.) and by topic (monetization, photography, marketing, etc.). I really hope to help other bloggers to reach their goals with both of the new sites. What are you looking for in Blogger Homes? Can anyone submit a space? Blogger Homes accepts submissions from anyone who has a blog and has created and decorated their own home’s rooms and spaces. It’s not really for professional designers or decorators because there are other sites for that. We have featured almost all rooms that have been submitted save for a few. The only real reason for us turning down submissions is poor photography or incomplete information on the online form. We would love to see even more bloggers submit spaces! How has blogging changed your life? Are you earning an income? And do you have any “secrets” or tips you are willing to share as to how you got to where you are? Blogging is a hobby and a business for me. I don’t have a design business or anything else than I’m trying to grow with my blogs – the BLOGS are the business. In Canada we are still behind the U.S. for income and working with brands. But as more bloggers focus on being entrepreneurs and learning the business parts of blogging, the faster we catch up. I have been earning a few hundred dollars a month for the last year or so. However I have recently changed some things and expect that amount to increase. I have so much further that I want to go that I hardly feel qualified to give advice on getting “there”. I have recently connected with a few bloggers on a level I haven’t before and from what I hear that “tribe” mentality is what really helps to grow a blog. What is next for you and your blog? Where do you hope to go from here? I hope to grow all three blogs into large recognizable brands in North America. AKA Design will be where people will continue to find beautiful crafts, frugal decorating ideas and fun DIY projects that we’ve made for our own house - in the hopes that they will be inspired to create the look and feel they want for their homes. Blogger Homes will be where people will go to find their favorite bloggers new spaces and where bloggers link their house tours so they can get more eyes on their own blogs. Blogger Resources will be a hub for bloggers looking for ways to take their blogs to the next level – whatever that is for them. I want to inspire people – be it with design or inspiration or information. I just want to inspire people! I love this idea Barbara...can't wait to see all the updates and love Shannon! I really like Shannon's design aesthetic. 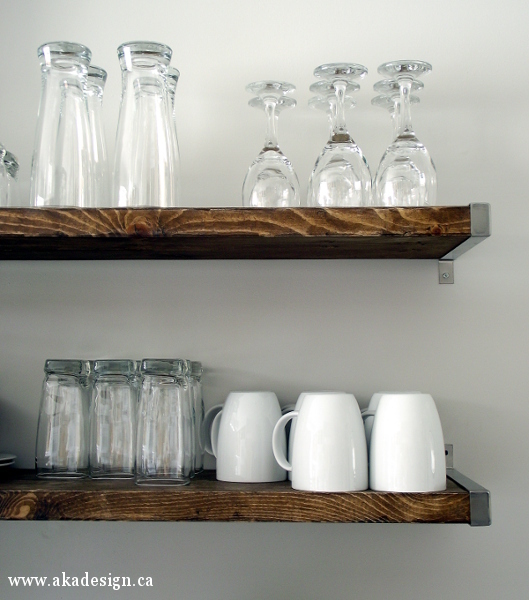 The stained wood kitchen shelves are to die for!!!! I'm going to check out her blogs, thanks Barbara. Shannon has certainly done well and I can't wait to see what others have accomplished!